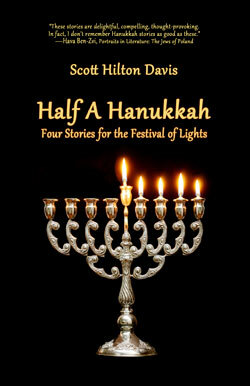 Celebrate the holiday of Hanukkah, the Festival of Lights, with four new short stories by Jewish storyteller Scott Hilton Davis. Meet the inhabitants of the tiny shtetl town of Oykvetchnik: Chaim the Chanukkiyah, the nine-branched Hanukkah menorah who feels out of place in the synagogue; Myzele the little mouse who helps an orphan boy learn his true calling; Reb Shimon the Shammes, the caretaker of the synagogue, who can’t remember where he put the big menorah; and the kindhearted Dovidl who discovers that the town beggar is the rightful owner of his family’s new menorah. Set in Eastern Europe at the turn of the 20th century, these sweet and poignant stories will fill your heart with the light of Jewish culture and values. A great gift and perfect for reading aloud during Hanukkah. Scott Hilton Davis is a Jewish storyteller and Emmy Award-winning public television producer. He is the author of Souls Are Flying! A Celebration of Jewish Stories and Between Heaven and Earth, four one-act plays based on the stories of I. L. Peretz. In 2007, Scott founded Jewish Storyteller Press to bring the works of 19th century Jewish writers to 21st century readers. His current passion is to recover the works of the once-beloved Yiddish writer Jacob Dinezon and make them available to a new generation of readers. He lives in Raleigh, North Carolina.